How to get yourself round the RideLondon course. 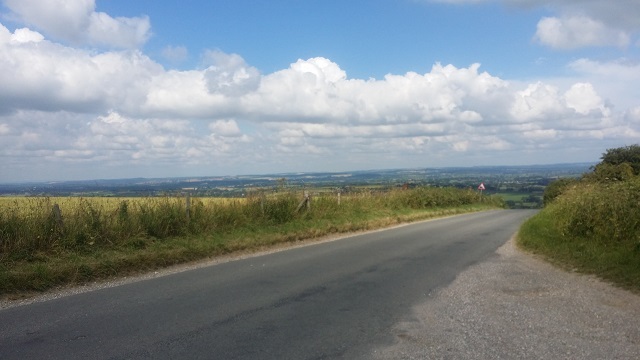 I thought I would write a post of my experience of last years read Ridelondon 100 with some insights into the course and what to expect as you attempt the 100 miles. This is not for the seasoned professional, but if you are attempting this sort of distance for the 1st time hopefully I can add a few nuggets of knowledge. The ride actually starts a few days before, basically get some decent food in you. I had a big spaghetti bolognaise the 2 nights before and topped up with Japanese ramen noodles for lunches and porridge oats for breakfast. Plenty of carbs, is what you want. On the day of the ride I had a nice big breakfast – porridge, toast and fruit juices and tea. It is hard to force yourself to eat at that time in the morning but its worth it if you can, you are going to use all those calories. Make sure you got all the gels / flapjack bars or whatever your food favourite is, packed in your easily reachable pocket. Eventually after all that nervous shuffling at the start and your 5th trip to the loo, you will roll out of the start gate with your fellow wave riders. Don’t go too fast at the beginning, I saw a lot of people going off at 20+ miles an hour straight out the gate. Its a long way round and its better to let your legs warm up slowly and your body get fully awake – and remember, the first 2 miles don’t even count !! !, so you are only using energy to get you to the real start line. Once you roll over the start mat (its clearly signposted) you will hear a beep and you are off. Find a group of riders going your speed. I did this by riding at the speed I felt comfortable at and then see who was just coming past me at a slightly faster pace. You can then get into the back of that group and conserve some energy (you are going to need it). Make sure you are taking on fluids regularly, take a drink at least every 20 / 30 mins even if its just a swig. I had two bottles on the bike and its best to make sure you are not going to be short. Top up your bottles when you need to (Hampton Court is a good place for the first refill) and you will get an idea of how much water you are using. Take an energy gel / food or something at regular points. Once you hit the tight turns at Ripley this is a good point to have a really good feed. 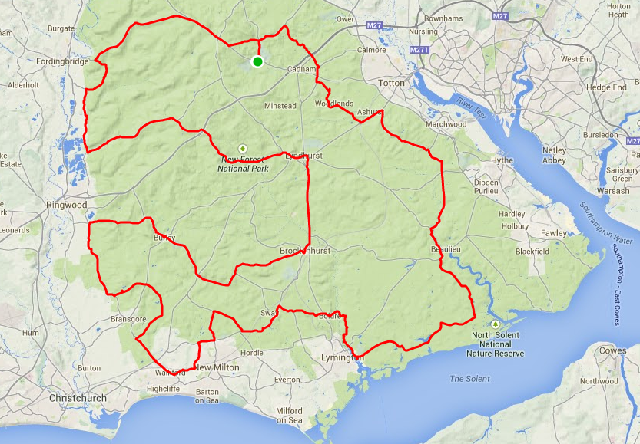 This gives the food enough time to get into your system for the lumpy Surrey Hills section (about 20-30 mins away). Basically make sure you are fuelled up BEFORE you hit the first big climb. Its too late to start eating once you are hungry and you will run out of energy. After you have done the hills I found it useful to just have a brief stop to jump off the bike for a 5 / 10 mins and stretch out. It resets the muscles a bit and stops the cramps and aches. Don’t be tempted to get off the bike for any longer, you will start to seize up and getting back on will be a very painful experience. I rode my own pace for the hills section and don’t be tempted to chase down faster groups. Be really careful on the decent off Leith hill, as you reach the turn off to Abinger Common the road gets really bad, coupled with some high sided walls there is potential for your day to end early in a pile up. Take it easy and get round in one piece. Once you get to Leatherhead (after Box hill) get a good refill / refuel and find another group to drag you back to London, there are no big hills now, so conserve energy so you have something left for a big finish. Now I said there are no more big hills but there is a nasty little surprise at Wimbledon, so you will be glad to have saved something in the legs. You are probably riding further than you have trained to now. Once you see the buildings are higher than 2 stories, you know you are close. Hang on and just pedal on the atmosphere of the event, it will get you home. I defy anyone not to have a little sprint on the Mall, even though you think you have nothing left in the legs. Ridelondon is getting very close now, only a few weeks away and the nerves are starting to kick in. The next big test was to see if these old legs still have the distance in them. I am in much better shape than I was last year and its good to be able to carry some of the fitness through, although as you people training for RideLondon are probably aware, most of the time its all in your head and cycling is mental challenge to keep going as well as a physical one. The order of the day was a long long ride in the New Forest to try and get close to the total distance and see if I can sit on a bike for a long time. The new forest is a beautiful place on a bike. The sun was shining and the roads pretty clear of traffic. You miss so much of the countryside from within a car, isolated in a metal box you miss out on so much that you get to experience on a bike. It was a hot day, so plenty of stops for water refills and refuelling. I just ticked the bike round no silly heroics today. Sometimes its nice just being out on the bike rather than trying to achieve training goals. The new forest ponies were out in force as were the cows and other wildlife. There are loads of little hamlets and villages hidden away off the main roads. Some beautiful thatched cottages and some great views over the forest, including the Isle of Wight and the sea. In total a distance of 88 miles was covered, which is pretty close to where I need to get to on the day. I feel good to have done a long one and am able to sit in the saddle for that long. A few more rides next week – with a possible long one. Then its the fun part of eating a ton of pasta just before the big day. 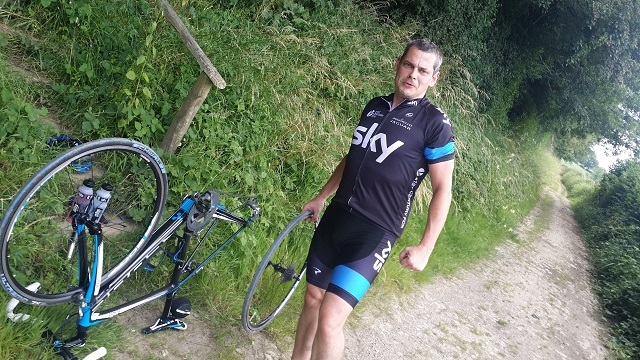 This Ridelondon thing seems to have a jinx on my bike just before the big day. If you remember last year I completely trashed the wheel. We are into the final weeks before the ride so something bad was bound to happen, and it did. I had planned a very nice ride down to Devon with my brother and all was going well. We had a few of the usual mishaps along the way a couple of punctures and routing issues (apparently Garmin have no understanding of the concept of a “No through road”) but all in all the the ride was great. Beautiful blue skies, sunshine, countryside and the roads were fantastic, we hardly saw a car all day. 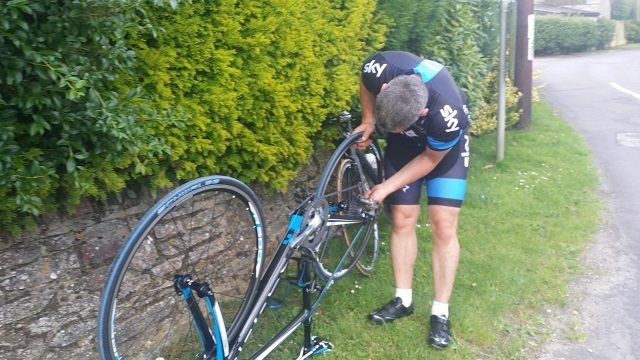 Even the punctures did not put a downer on the day. Although my pump is on its way out (need to get a new one ordered). The clock is ticking on the puncture change, stop posing and fix it. He’s getting good at this. The big issue occurs when I had the chain fly off, going up one of the steep sections. 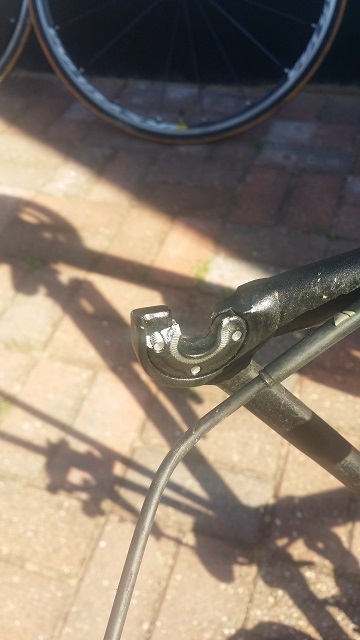 I had changed the chain about 2 weeks back so it was fairly new and had already ridden some 200km on it and it had been fine. 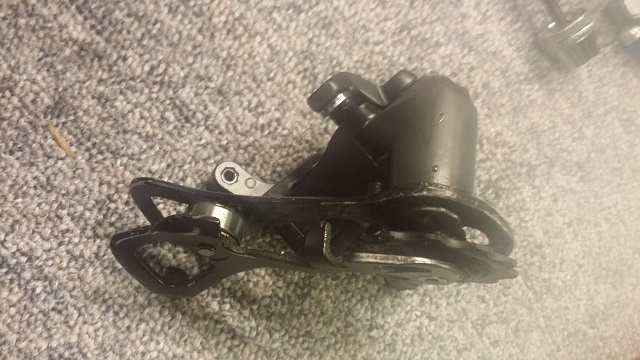 Looking at the break, the rivet had given way and the chain was off. No big deal for us hardy cyclists and soon I had removed the 3 bent links and remade the chain with my fancy tool, and we rode on. A few more recce rides. Well training is coming along well, am feeling good on the bike again and can ride all day. 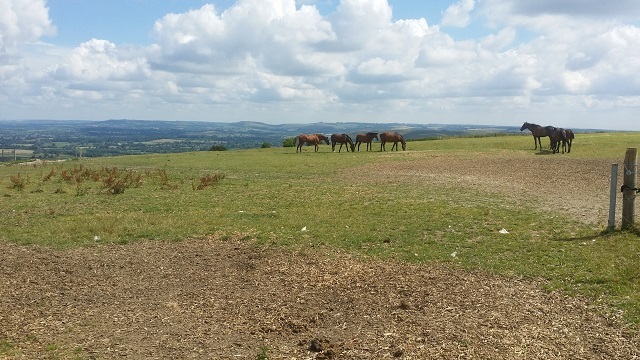 We have had a nice break in the weather and its been glorious to just get out and enjoy the scenery and outdoors. Have done a few more checkouts of the route and am amazed at how many cyclists are out and about the numbers are definitely increasing on this stretch of road. Lots of official Ridelondon jerseys and some very nice new bikes Leith and Box hill are now a mecca for those on two wheels. I am glad to report the bridge on Newark Lane is now almost done (just some line painting to do) some very nice new tarmac along that stretch of road. 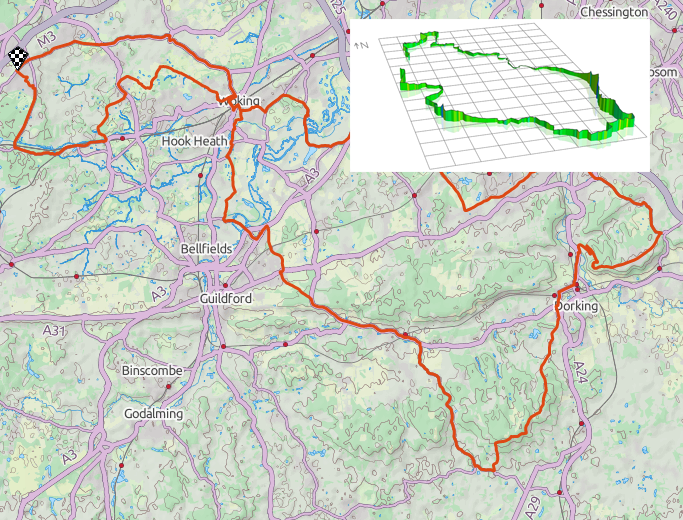 On the other hand there is the equivalent of the Grand Canyon on the B2126 between Forest Green and Leith Hill lane. The road was currently shut as from last weekend. You can just about get past with a bike as long as you can throw your bike over a 6 foot high fence and then get past a few prickly holly bushes. The road should be fixed in a few days hopefully, they have sorted out the subsidence but just need to fill in the trench and tarmac it over. Checking out the RideLondon route again. Its getting close now, the signs are up along the route for advanced road closures. Get on your bike people – NOT LONG TO GO NOW !!! !